Priced at $38 for 5.1 oz. It’s official. I’ve finally depleted all of my birthday sample from Sephora and made it to the end of the small tube I had of this stuff. 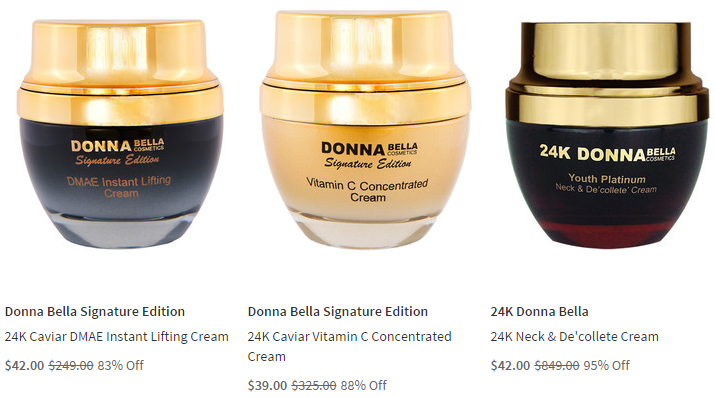 Posted on January 24, 2016 January 27, 2016 by JennaPosted in Beauty, SalesTagged 24k, Beauty, caviar, Donna Bella, hautelook, sales, skin care. 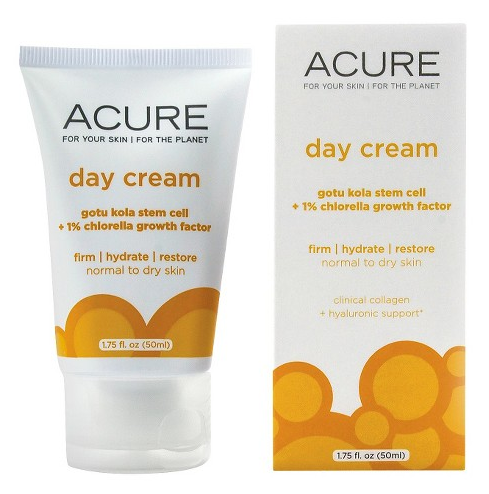 I’ve had previous experiences with this brand through both ipsy and Target, and I’ve yet to be disappointed. They even make one of the few shampoos that doesn’t dry out my hair. So when I got this in my Target Beauty Box, it was one of the first things I tried. Posted on January 21, 2016 January 16, 2016 by JennaPosted in BeautyTagged acure, Beauty, day cream, skin care, Target, target beauty box. Posted on January 1, 2016 by JennaPosted in BeautyTagged #iFabboMember, #StriVeSTORY, Beauty, pore refiner, skin care, strivectin. Now that I’ve gotten both boxes and had a chance to try out the stuff in them, I figured I’d share my thoughts on the products inside. 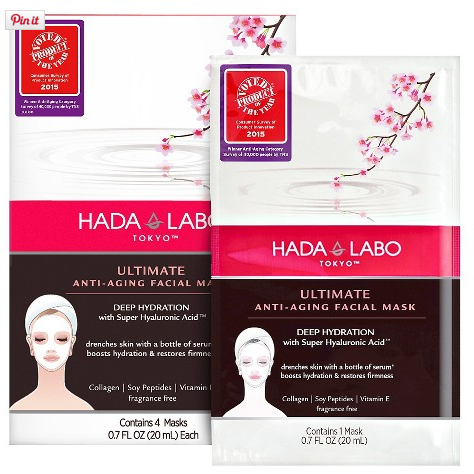 I stated before that I’ve used products from this brand in the past. Considering my previous experience, I was a little surprised to find that the full size of this was only $36. As I’d expect from a serum, this is lightweight and very moisturizing, but I had to use a lot of it, and I imagine I’ll only get about three uses out of the tube I was sent. I doubt I’ll buy the full size. I just wasn’t that impressed. This is nearly half the size of the full size tube. Not bad. Tati suggests having this next to my bed and putting it on before I go to sleep. I’ll admit it’s great for preventing chapped lips. It feels a bit like thin Vaseline, but I haven’t noticed any enhancement. This stuff is expensive, but I have to admit that I was impressed with how well this stuff hydrates. I’ll definitely use up what I’ve got. 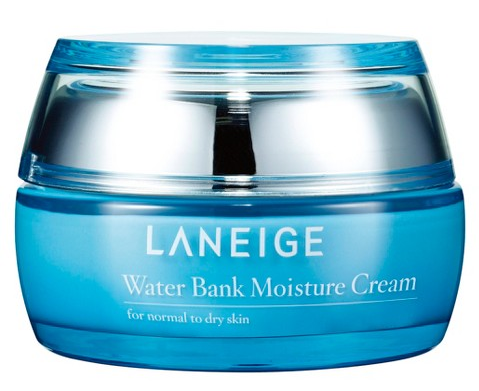 The first time I used it, I dispensed about the same amount I usually do of my regular eye gel, and it was WAY too much, so I’ve been more sparing with it since. A little really goes a long way. Am I impressed enough to spend $65 on the full size? Probably not, but it’s on my Christmas wish list now. I go through a lot of dry shampoo since I don’t wash my hair every day. This stuff goes on clear. There’s no annoying white powder in my hair when I use it. I already had another product under my cabinet from this same brand– the No Frizz styling cream— which I also love. The styling cream has a fresh grapefruit scent to it. The dry shampoo doesn’t smell exactly the same, and I can’t quite place it, but I’m just as in love with it. I might end up purchasing this again if I can ever get through my current stockpile of dry shampoos. This was a full size shadow stick. I have so many eyeshadows and lipsticks and yet I keep buying more because some part of me is that child who wants that gigantic box of crayons. This was really nice. It glides on true to color, and it really does stay put and wears comfortably. I’ve had rotten luck in the past with similar products that would crease or smudge easily. I like that this stays in place without even needing a primer. It also paired well with my beloved Naked 2 palette. I’m VERY tempted to run on over to the Birchbox store and use my points getting the full lip and eye collection. I’m that impressed. If anyone got a sample of the lip color, let me know in the comments what you thought of it. Is it budge-free? Does it transfer a little too easily? Is the finish a true matte? How does it feel? I need to know these things. The total value of my November box was $52.39— not bad for a $10 box, and I’ll use everything. 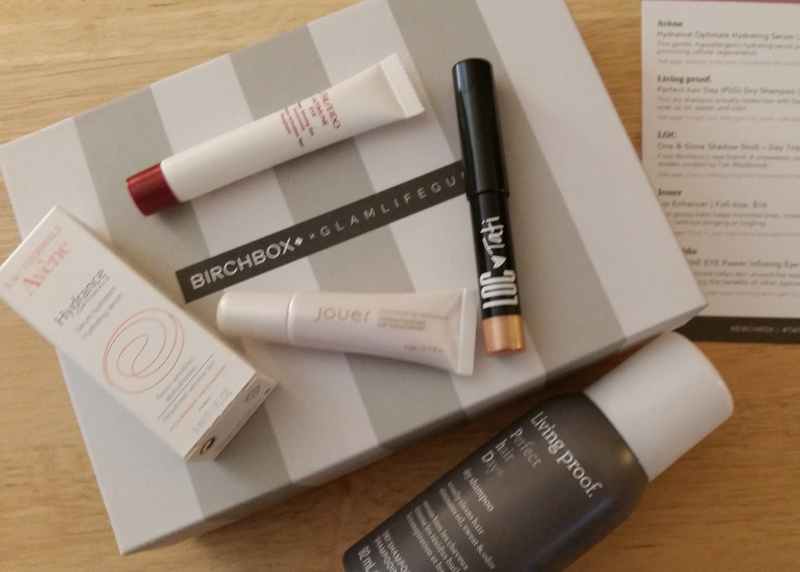 If you’d like to try Birchbox, click here for my referral link. You can also get 50 points added to your account with a new subscription when you use the code SUBSCRIBENOW50 at check out. This item alone paid for the bag, so that’s nice to have right out of the box. The bristles are synthetic and super soft. I still lean toward my Sonia Kashuk goat hair brush as my absolute favorite for blush and bronzer, but this will make a nice backup. I’m not super picky about mascara as long as it doesn’t flake or smudge easily. This doesn’t, and I love the brush. Would I purchase it again? Probably not. I just can’t justify the price considering there are other, much cheaper mascaras that also work for me, and I toss mine after about a month or two. Not to mention, I usually have 2-3 mascaras on hand due to my subscription boxes and gift sets. It’s a nice mascara, though, if you’re willing to spend $20 for a full size tube. Mascara just isn’t one of those things I tend to splurge on. I was running low on scrub, and I didn’t care for the sample I got in my Target box, so this was nice to find in my bag. It’s REALLY THICK, and at first I thought maybe it had dried up in the tube, but persistence paid off. (I’d hope that the full size is a little easier to dispense.) It has a pleasant, sweet smell and feels great on the skin. This has such a gorgeous, floral fragrance. Right now, I can’t stop sniffing my wrist where I applied it, and I’m sure I look like a total weirdo. It’s not overwhelming at all, and if I didn’t have a huge stash of fragrance samples (see also, the reason I have a mascara stash) I’d consider buying a full bottle. The only issue I have with the roller ball is that it might be a bit too subtle. I felt like I had to use a lot of it for it to be noticeable, particularly compared to the vanilla roller ball ipsy sent me last month, but if you don’t like overly heavy perfume, this is could be a good thing. It was also long lasting, and I think it’ll combine well with the vanilla. Unfortunately, all I see on their site is the cologne spray, and I don’t know if that’ll last as long as the perfume oil, but it has a very reasonable price point for the full size spray. According to ipsy, those who got this will get it in either Dark Grey or Ash Silver. Mine was in Ash Silver, which I’m thankful for because I don’t actually have a silver eye pencil. I have two dark grey pencils. 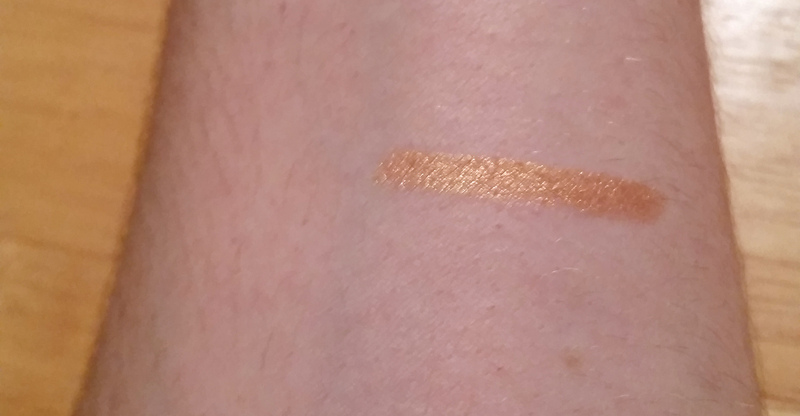 This is a gorgeous shade (see swatch below) with just a hint of shimmer. I can see myself using it on upper or lower lashes, and it’s a great color heading into the holidays. 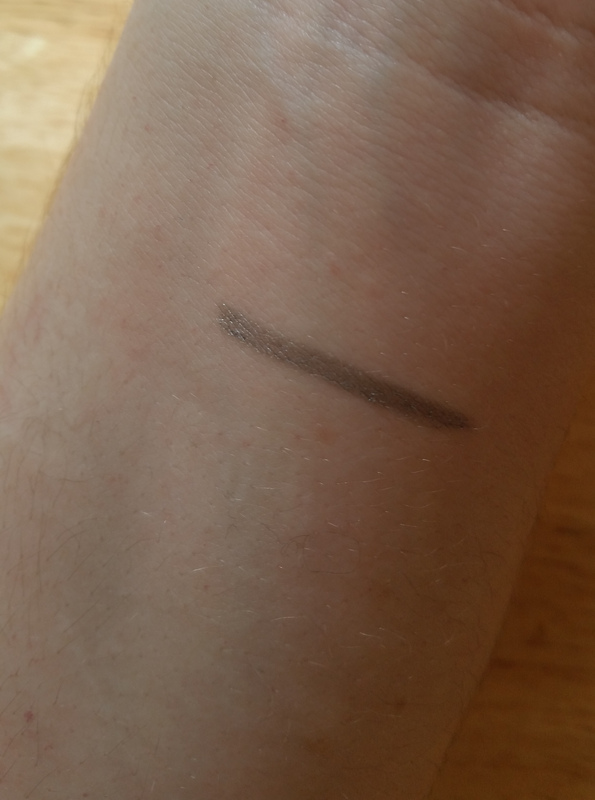 It’s not smudge-proof, which I prefer in an eye pencil, but the product doesn’t claim to be, and I can always use another eye pencil. Plus it’s only a $3 pencil. The total value of my November bag was $34.64, not counting the cute makeup bags I get every month, and I’ll use everything here. 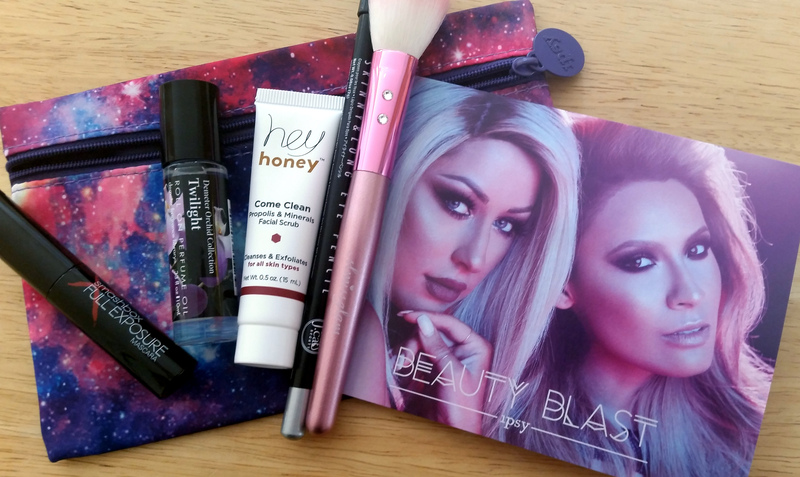 If you would like to try Ipsy, click here for my referral link. As far as I know, there aren’t any coupon codes to use right now, but I’ll keep you posted. One of the things I’m not too fond of with Ipsy… When you first sign up, they’ll place you on a waitlist. You can skip the waitlist by sharing on social media (and you can later either remove those posts or set them so that only you can view them), but I find it annoying that you’re forced into viral marketing in that way. Still, it’s a wonderful way to try out new products, and it’s absolutely a great value.